Our online learning services platform is your digital locker for course materials, resources and tools. As your personal concierge, MyGK has everything you need to succeed in one convenient location. MyGK provides enrolled students with easy-to-find course information and interactive features personalized to maximize training and performance. 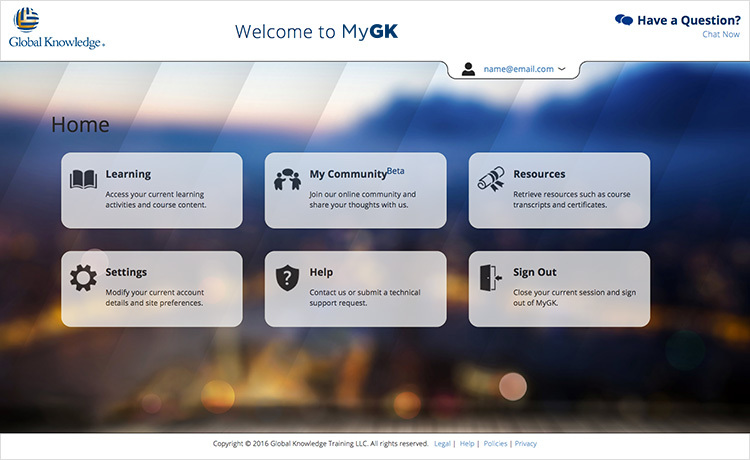 Manage your past, present and future Global Knowledge learning experience simply by logging in to MyGK. Enhance your Global Knowledge training experience before, during and after class with MyGK. View your current and past course history. Explore what classes to take next based on your prior training. Retrieve course transcripts and certificates. Access your training materials and courseware, including everything from pre-class exercises and personal assessments to study aids and labs. Participate in our interactive forum where subject matter experts provide guidance on technical and course topics. Share knowledge and chat with peers in your field. Access white papers that are hand-picked based on your learning interests. Update your personal preferences and contact information.